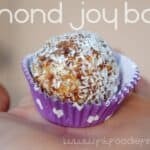 Make snack time easy this week and make a batch of these easy coconut chocolate energy balls for a healthy meal prep snack throughout the week. 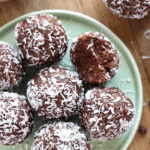 These delicious energy balls are no bake, easy to make, and taste like an almond joy. Does it get any better? 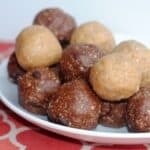 Energy Balls- the easiest healthy snack around! 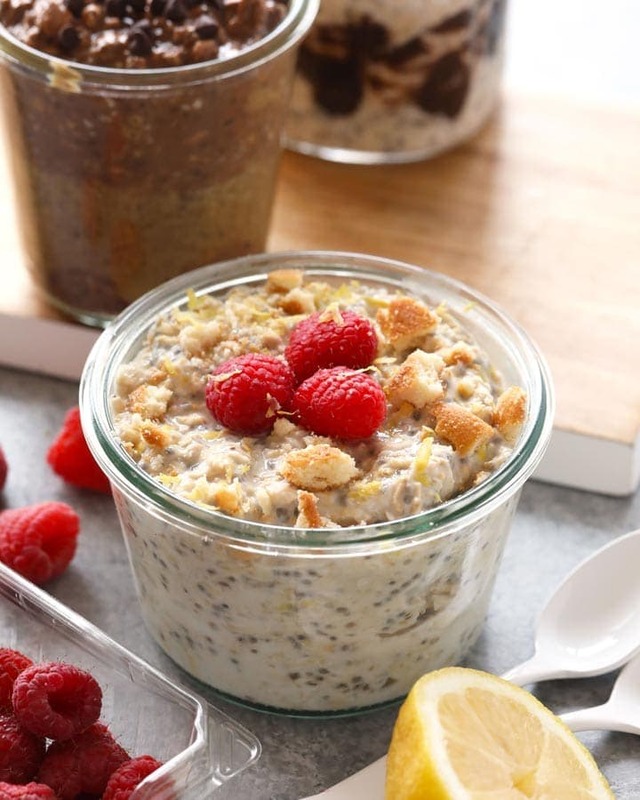 There is no secret that we love snacking here on Fit Foodie Finds. Life can get a little crazy and it helps to have healthy snacks on hand when there is just no time to whip up a batch of your favorite hummus or smoothie! 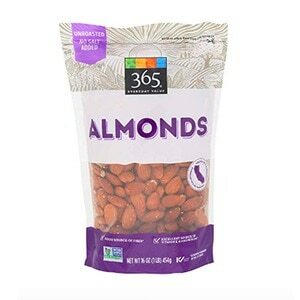 There is a time and a place for all snacks, but when it comes to an easy grab-n-go snack that is also delicious, you can’t beat an ENERGY BALL. It is no secret that we have been obsessed with energy balls since the beginning of time. During college, Lee and I used to dream up companies that would exclusively sell energy balls (back then they were called ‘hippie balls’). One thing leads to another and Fit Foodie Finds took off and energy balls happened to be everybody’s favorite snack! If you have been a Fit Foodie for a while now, you’ve probably tried our Peanut Butter Energy Balls. They were one of the first no bake treats that we fell head over heels in love with. And? So did you! People discovered the greatness of these energy balls of heaven and the rest is history. 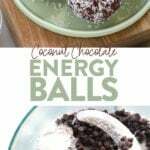 We thought we would add another delicious flavor combination to our energy ball repertoire. 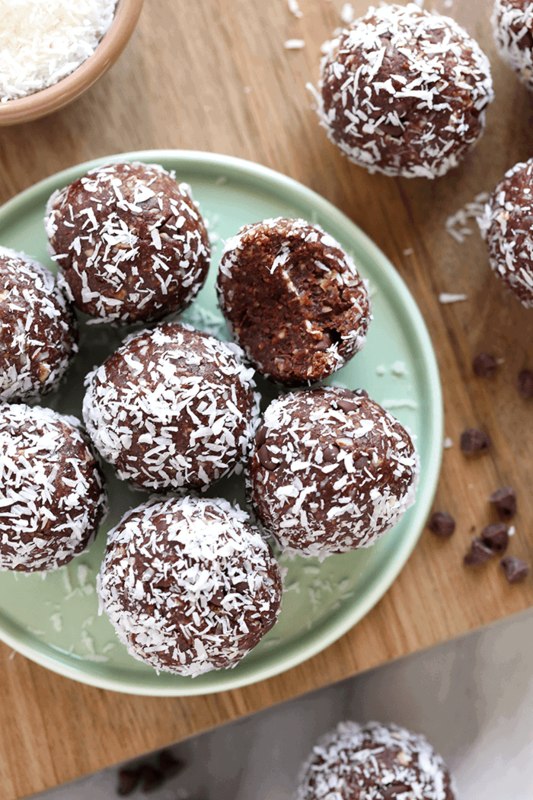 I give you–> COCONUT CHOCOLATE ENERGY BALLS. 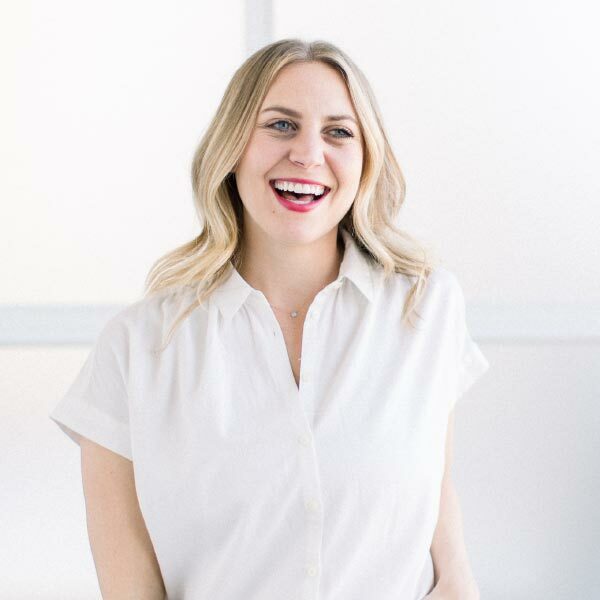 Why should I make Energy Balls? Is that even a question? Let me count the ways! Energy balls are naturally sweetened Generally, we make our energy balls with dates and other dried fruits. So, no refined sugar necessary! No oven? No problem! 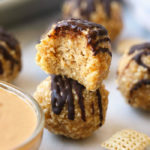 All of our energy balls are no bake snacks! All you have to do is throw your ingredients into a food processor, blend, add some moisture, and BOOM. They are BEST meal prep snack around town! Having healthy snacks available during the week is a good way to make sure that you snack smart. Try making an extra batch of healthy energy balls and store them in the freezer! On-the-Go Snackin’Is there anything better than having a grab-n-go snack when you are having a busy morning? Or maybe you have kids that need to constantly be eating! Throw an energy ball their way. I promise it will tide them over until dinner! Making energy balls is a lot easier than it looks. 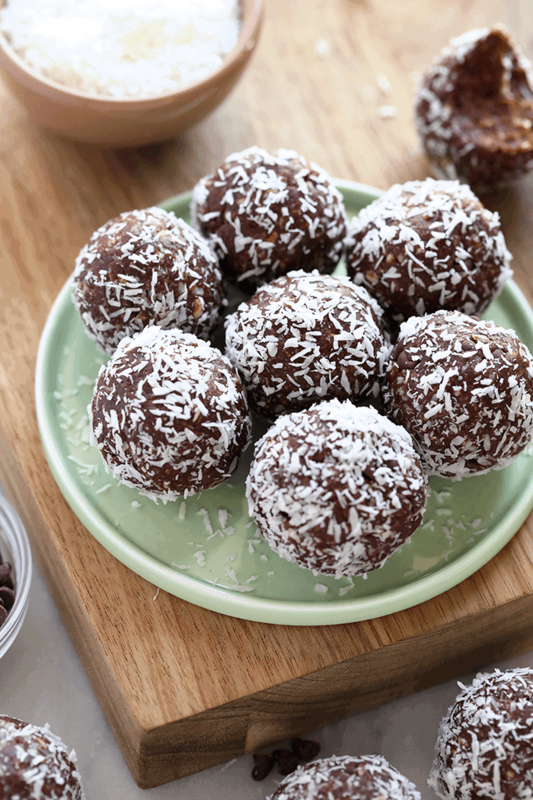 Yes, these coconut chocolate energy balls are beautiful and uniform. NEWSFLASH–> All of our energy balls don’t always look like this (we do it for the photo). These balls are gorgeous, but we usually have energy balls in all shapes and sizes. There are a couple things to keep in mind when you are preparing to make a batch of healthy energy balls. SEE BELOW. 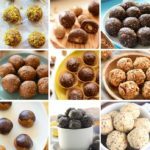 If we ever receive a comment on a blog post from one of our people that says their energy balls turned out too dry, the first thing we ask is “What kind of dates did you use?”. 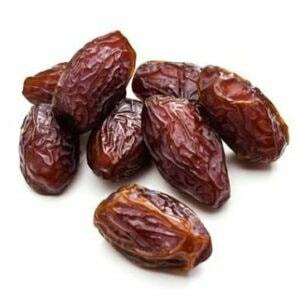 We like to make sure we buy the freshest dates possible. We use Medjool dates and you can usually find them produce section of your grocery store! Even if you do buy the freshest dates possible, you want to make sure that they are squishy and that the pit is easy to remove. This is the best case scenario! If you do have some drier dates or if you’re using packaged dates, just know that you will have to add a teaspoon or two of water to your ball mixture for extra moisture. CAUTION- add water SLOWLY at first. A little goes a long way! 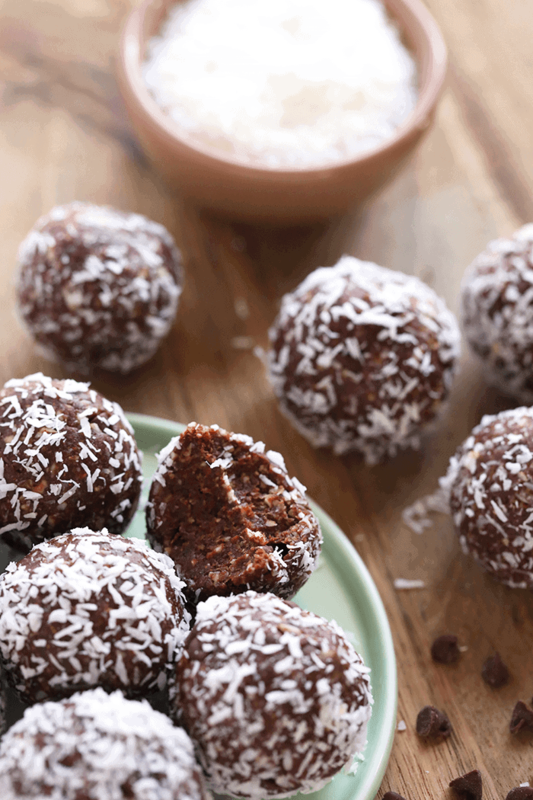 For this coconut chocolate energy ball recipe, we used almonds! Feel free to use whatever nut you would like. Nuts are like dates when it comes to energy balls. Sometimes you will find that some nuts (cashews, almonds, hazelnuts, etc.) are more oily than others. Just be careful to not over blend the nuts you use in the food processor. Sometimes, if you blend nuts for too long, you release more oils and you will eventually turn those nuts into nut butter! One way to avoid this is to keep your eye on your food processor and make sure you shut your food processor off right when you notice that larger nut chunks are all ground up. The coconut + chocolate combination is one of our favorites. 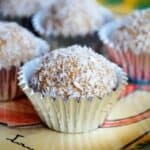 We wanted to add a little ‘meat’ to this ball recipe and shredded coconut was an obvious choice. Sometimes we like to add dried fruit, like blueberries in this Blueberry Truffles recipe. It adds a little extra flavor. However, feel free to add in any of the delicious mix-in’s below to make a ball recipe your own! We like to store our energy balls in the freezer because they last a bit longer and they will stay fresh! Generally, we make a batch of balls, roll them out, and place them on a baking sheet and stick them in the freezer for 10-15 minutes. After that, we will transfer them to a freezer safe bag for easy storage! We freeze them on a baking sheet beforehand so they don’t all stick together in a freezer bag (we’ve learned from personal experience..trust us). Next, scoop a heaping tablespoon of dough into your hands and roll into a ball. 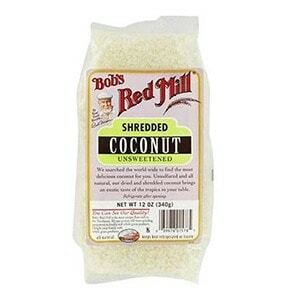 Roll the ball in optional shredded coconut and place on a baking sheet. Repeat until dough is gone. Place baking sheet in the freezer for 10-15 minutes and then transfer balls to a freezer safe bag and store in the freezer. *Do not blend almond meal too long or it will turn into nut butter! **You may need to add a few teaspoons of water to the mixture depending on how sticky your dates are.